In view of the growing world population, within two decades global demand for food is projected to increase by 50 per cent, demand for water by 35-60 per cent, and demand for energy by 45 per cent. The world’s soils are consequently under increasing pressure. Soil carbon plays a vital role in regulating climate, water supplies and biodiversity, and therefore in providing the ecosystem services that are essential to human well-being. Managing soils to obtain multiple economic, societal and environmental benefits requires integrated policies and incentives that maintain and enhance soil carbon. Decisive action needs to be taken to limit soil carbon loss due to erosion and emissions of carbon dioxide and other greenhouse gases to the atmosphere. To read the document - UNEP Year book 2012. 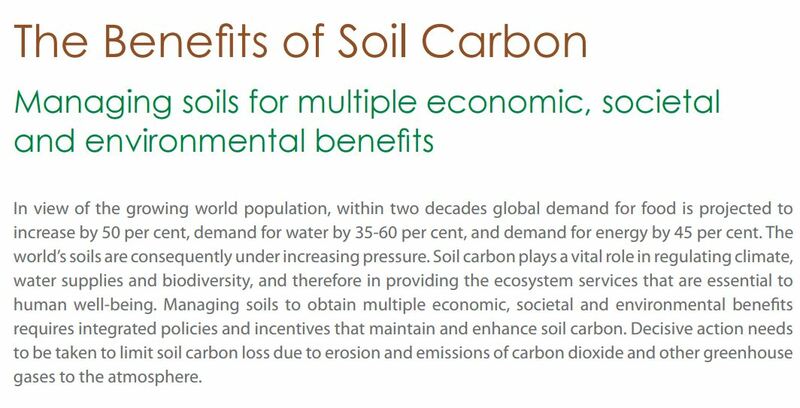 The benefits of soil carbon. Authors: Reynaldo Victoria (chair), Steven Banwart, Helaina Black, John Ingram, Hans Joosten, Eleanor Milne and Elke Noellemeyer. Science writer: Yvonne Baskin.